We stand by all our unique Alfresco Life roofing products, and to really experience the difference they can make, come and visit us at our Alfresco Life display centre in Malaga where we can show you the roofing systems on real life alfrescos. You will be amazed at the difference our roofing products will make to your new alfresco. Alfresco Life flat deck roof panels offer superior performance, great aesthetics and limitless design solutions. Each Alfresco Life flat deck roofing panel is 300mm wide and features a clipping system that locks the panels together, forming a virtually undetectable weather-tight seal. Alfresco Life flat deck roofing panels may be used for all outdoor home improvement situations and is ideally suited for the construction of all alfresco roof styles including flat, gable and the popular hipped gable and skillion roof styles. Flat Profile: Provide an enhanced aesthetic replicating a flat ‘ceiling’ appearance. The flat surface helps create a light, bright and spacious area as it allows light to be easily reflected around the covered area. W-Pan Profile: The robust W-Pan profile offers a traditional style of roof appearance. Solid and long-lasting, the W-Pan creates an outdoor undercover area built to last. Alfresco Life single skin roofing panels can be integrated with Alfresco Life Naturelite Skylight Panels to allow you to control how much light you want in your outdoor area. Complete with a high gloss finish using the ALFRESCO LIFE COLOUR-COTE Process, Alfresco Life single skin roofing panels are durable, maintenance free and backed by our 10 year warranty for STEEL single-skin panels and 15 year warranty for ALUMINUM single-skin panels. The panels are available in 0.42mm steel as well as 0.72mm and 0.9mm aluminium. Alfresco Life Flat Deck roofing panels provide endless possibilities to create your perfect home improvement solution. Alfresco Life Flat Deck – 28 Exclusive colour combinations available. 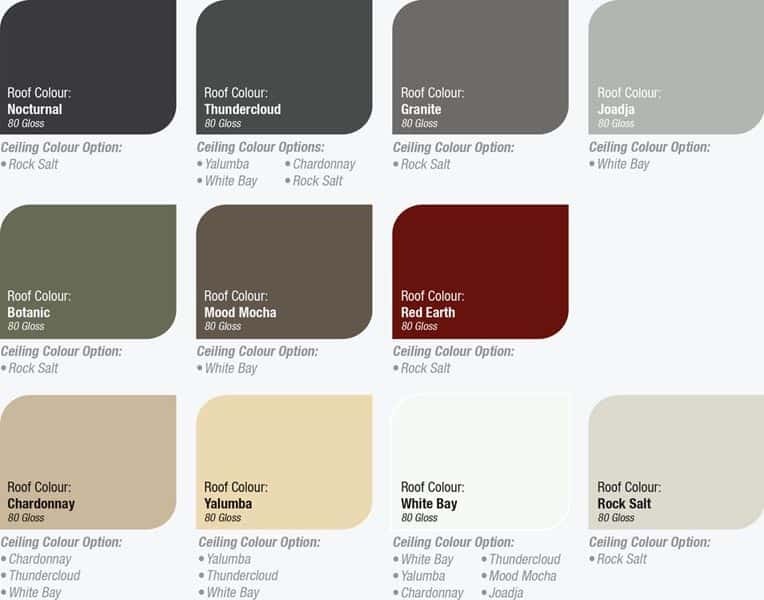 Alfresco Life Flat Deck roofing panels also come in 5 timber grain ceiling options – CEDAR, JARRAH, LIGHT OAK, TASSIE OAK & WHITE FOREST MIST.